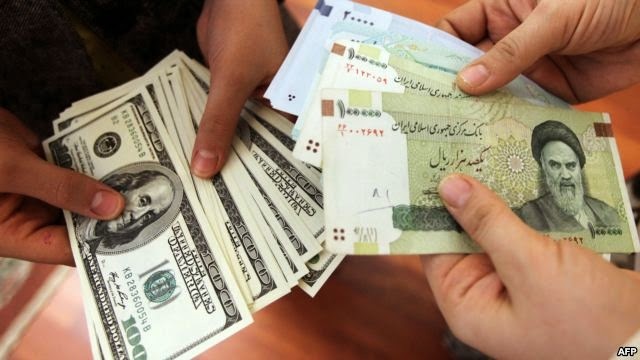 Iranian currency rial continued its downward spiral, trading at 35,000 rials (3,500 tomans) per dollar on Sunday. Rial fell to record low in Januray 2013 at 40,000 rials/dollar. But after the election of Hassan Rouhani as the country's new president in June 2013, the rial value climbed to 28,000 rials/dollar. Now it seems we are back to pre-Rouhani days. It seems market’s lack of confidence in Rouhani’s economic reforms, his inability to lift the sanctions, plus plunging oil prices are exerting downward pressures on rial, with no immediate end in sight. The government, suffering from nearly 40-percent decline in oil revenues, might not be able to defend rial as much as it likes; hard-currency revenues are so much lower than expected and budgeted for. UPDATE: On Monday, rial gained back losses and traded at 34,000 a dollar, this after the minister of economy pledged to support the national currency. It is believed that the central bank poured large amounts of dollars into the country's currency-exchange free market, purchasing rials to stabilize it. It was not clear how much the move has cost the government, but subsidizing currency could be quite costly. hoard sugar and cooking oil and all the pharmaceuticals you can get.